The enclosure material which houses sensitive electronic and automation components will impact their lifespan, functionality, and performance. Of the numerous materials available, each offers different protective advantages. The enclosure material which houses sensitive electronic and automation components will impact their lifespan, functionality, and performance. Of the numerous materials available, each offers different protective advantages. The following questions and answers address the impact of use, interface, and modifications on the enclosure and the components housed within. What are the key environmental considerations in selecting the appropriate enclosure? The exposure of the enclosure to corrosive elements is inevitable. Even air/oxygen and water can be slightly corrosive. A complete assessment of the corrosive gas, vapor, liquid and particulate matter vulnerability is needed. Included should be all environmental factors: weather, temperature, humidity and solar. Resistance properties of every part of the enclosure assembly should be considered to prevent a window, gasket, latch or another accessory from being a corrosive weak link. The most common enclosure materials are painted carbon steel, Type 304 stainless steel, Type 316 stainless steel, fiberglass, and polycarbonate. Painted carbon steel is a cost-effective choice, with a semi-durable finish best suited for indoor applications. Corrosion resistance is limited. Type 304 stainless steel’s addition of chromium increases resistance to oxidation and most corrosive solvents, alkalis, and some acids. This material withstands wash down cleaning processes and is suitable for both indoor and outdoor use. 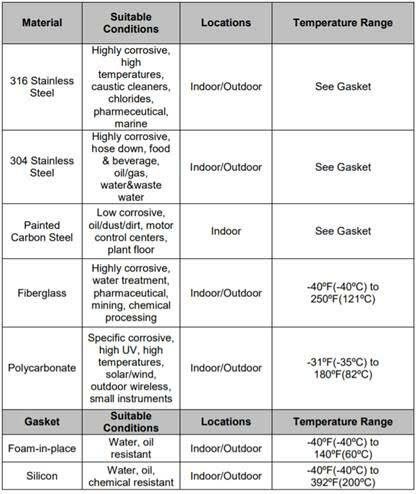 Molybdenum in Type 316 stainless steel greatly increases corrosive resistance in virtually any exposure, including chlorine, sea water, sulfates, bromides and high temperatures. Fiberglass reinforced polyester is lightweight and corrosion resistant. Its impact resistance is excellent. Extended exposure to UV rays increases color fade and fiber bloom, which does not decrease its effectiveness but is an aesthetic concern. Polycarbonate enclosures are formed with a thermoplastic polymer, with greater impact and UV resistance than fiberglass. They are generally superior to fiberglass in product life and corrosive resistance. The most common use of polycarbonate enclosures are smaller instrument and junction boxes, both indoors and out. Are there potential effects from radio or electromagnetic interference? Electromagnetic interference (EMI) and radio waves will affect an electrical circuit due to either induction or radiation emitted from an external source. Metallic enclosures naturally provide against both and can be reinforced with special gaskets. Non-metallic enclosures offer no protection against radio waves or EMI. A fiberglass or polycarbonate enclosure can be upgraded with the application of a metallic coating to its interior. What strength and weight restrictions will affect my enclosure selection? Enclosures must be able to provide a specific level of environmental protection for the components housed within. However, enclosure stressors including the component density, tamper and denting resistance and overall weight impact material selection. Metallic enclosures can carry greater loads and are stronger than non-metallic enclosures overall. The weight and strength provide superior resistance to tampering. They are susceptible to denting, which non-metallic enclosures are not. Non-metallic enclosures are significantly lighter before loading and may be suited to pole, wall or ceiling mounted installations. Do potential modifications impact the material selection? Due to material hardness, manually adding cutouts and holes to stainless steel enclosures is far more difficult than modifying carbon steel enclosures. Modifying painted carbon steel enclosures does require paint touchup to protect from corrosion in areas where the paint chipped. Fiberglass and polycarbonate are much easier than steel to modify, but these materials can splinter and produce a very fine, potentially harmful dust. Modifications to polycarbonate are more precise, and cleanup is easier and safer than fiberglass. Does my climate control efficiency vary with different materials? Metallic enclosures conduct and dissipate heat. 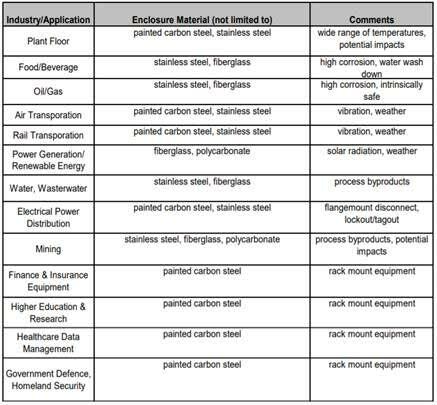 Carbon or stainless steel is the best choice of material for thermal transfer. These materials will dissipate heat from inside the enclosure when the ambient temperature is lower than the desired internal temperature. Fiberglass and polycarbonate enclosures do not conduct heat; therefore, any heat transfer would require fans or air conditioning. The material in a non-metallic enclosure acts as an insulator, keeping the internal temperature warm when the ambient temperature is cool and vice versa. What materials are effective for viewing windows? Technological advances in material science have expanded available options when selecting a window material. Acrylic (or Plexiglas) is the most cost-efficient window material. Acrylic is flexible, lightweight, and has greater impact resistance than glass. Due to its softness, scratches and blemishes can be removed by buffing. Acrylic has optical clarity, filters ultraviolet light, and cracks instead of shattering. Acrylic does not turn yellow with age and is a better insulator than glass. Acrylic has excellent weather resistance. Polycarbonate (or Lexan) is more expensive than acrylic but has many advantages. Polycarbonate is more impact and chip resistant, more flexible, and has greater heat stability than acrylic. Polycarbonate does turn yellow over time and is more likely to scratch than acrylic. Advances in coatings for polycarbonate have improved its UV filtering, light transmission, weathering, and scratch resistance characteristics. A watertight seal is achievable on polycarbonate windows. Glass disadvantages of higher cost, greater weight, inflexibility, and poor insulating properties often outweigh the advantages of visual clarity, heat resistance, and ease of cleaning. It is no longer a preferred choice for most windows. Whatever the application or environment, choosing the right enclosure material will ensure that the components and equipment housed inside will be protected from the environment, electronic interference, and physical abuse. Troy Miesse is currently the Product Manager for Industrial Enclosures at Rittal North America. With over 20 years’ experience, Troy is an accomplished and knowledgeable expert when it comes to electrical controls and industrial automation. Over the years, Troy has held various roles at Rittal, including leading the North American Systems Consulting group responsible for engineering/ design, technical sales support, and product specifications. 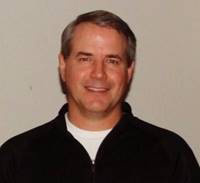 Troy holds his Bachelor’s Degree in Electrical Engineering from Franklin University and a Master’s Degree in Business & Engineering Management from the University of Idaho. Rittal North America LLC, headquartered in Schaumburg, Illinois, is the U.S. subsidiary of Rittal GmbH & Co. KG and manufactures the world's leading industrial and IT enclosures, racks and accessories, including high efficiency, high density power management and climate control systems for industrial, data center, outdoor and hybrid applications. 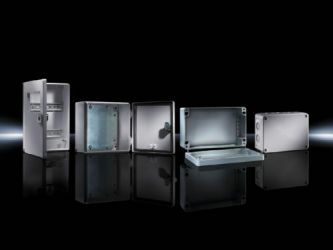 Rittal's off-the-shelf standard, modified standard and custom-engineered products are known throughout the world as high-quality, affordable solutions for practically any industrial or IT infrastructure application - from single enclosures to comprehensive systems. Your Business Depends on the Right Enclosure. Our Guide Can Help You Choose Better. Booth #134424 - Rittal has the opportunity to demonstrate our full product line with the business unit extension Rittal Automation Systems together with sister companies EPLAN and CIDEON.